(…)“Its theatrical dimensions have been reinvested in the pictorial image.” That is how what has just been proposed sounds in a text by the New York theoretician Douglas Crimp in the year 1979. Crimp noticed that the gestures of presentation, having grown ever more important in art since the late ‘60s, gestures articulated in performance, in films and videos, gestures which were in effect incorporated into the discussion of the theatrical, had once again caved in to the squareness of the traditional picture format. (…) The fact that staged and pict­orial elements, the act of compulsion and the medium of authenticity henceforth merged, was something new. Crimp organized an exhibition, simply calling it “Pictures” and managed to turn it into one of the central premises of the Postmodern. 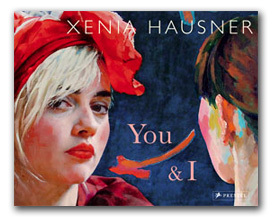 It is superfluous to mention that such a premise has managed to express the manifesto of Xenia Hausner’s picture world. And it is of notable consequence, when something that Crimp had once expounded has become reality: “Performance becomes just one of a number of ways of staging a picture.” That is nothing less than a declaration of the sovereignty of the picture. When in Xenia Hausner’s realm theater people, actors, extras yield to the performative, then it is to execute their poses so as to make an image, a picture, a panel painting,a squareness of forms and colors come about. “Staging a picture” is the perfect, the very literal formulation of Hausner’s strategy of pictorialization. There is another consequence, and it too is explicitly drawn into this work: the parallelism of painting and photo­­g­raphy. Here too Xenia Hausner’s works are clearly beyond modernistic, most evidently emancipated from the relationship to form. Both photography and painting contribute to that pool of motifs one helps oneself to when an image, a picture, something pictorial is supposed to evolve. It can be a painting that evolves, a photograph or a mixture of both, that hybrid form that makes every aesthetic form capitulate. One last point which focuses on the problem from the opposite end: it is marked by a special quality of Xenia Hausner’s, the attempt to overcome the squareness of the picture, the panel picture form, and to piece on parts, to push beyond the accustomed dimensions, and in this way to put the format, the manner into question. The picture isconfirmed by perceiving it as a corset, a limitation of freedom. But the picture stages itself all the more impressively in just such demonstrations of a denial. (…) Meanwhile a rational, male, coded conceptual painting style appears to stand in opposition to an empathetic, female humanistic one. The fact that the artist places herself “in the middle”, doing the one and not allowing the other moves through this and many other pictures of hers as a leitmotiv. She is shooting herself in the head with just “one left hand” while her right hand is apparently continuing to portray itself. Meanwhile, her “male” creator hand remains ironically “under the table” as if it had been cut off, while the pinkish knob of the striped jar turns up right there in front of the unsubstantial upper body where we would expect the “female” curves of the the breasts to be. In the interplay between figure and fundament, form and thing, colors and shapes, a kaleidoscope of multiple meanings, complementing each other, crossing over, overlapping, contracting, unravels as we watch. Chimaeras or doppelganger are often the result: the male-female artist, modern twin figures à la Snow White and Rose Red, paired lovers among humans and humanlike things. The hand raises each single colored element from its neighbor without shaking. Finger acrobatics, unhinging the artful construction gently and with concentration, releasing associations, drawing the sticks back into its power. That too carries magic features. Too bad that gesture has pretty much lost its magic thanks to the undo button in electronic media. The act of taking-back thus becomes an analytical anatomy, undoing that lucky throw of an artwork by comprehending it after the fact. (…) The photos have now become – like the medium of painting and various other materials used – the “raw material” of the images as the artist herself formulates it. They are stimulants for picture ideas allowing the human portrait to be set in focus and framed in a new way. Hausner’s photographs, long rendered as memory scenarios, turn a portrait into something concrete, real. At the same time they historicize the objectof a portrait. The new pictures are interwoven combinations of painting, processed cardboard and photographic fragments which develop a complex associative space thanks to their formal pertinence. In the resulting clash between real and imaginary these works achieve an almost lyrical character which sets a new accent in her images.